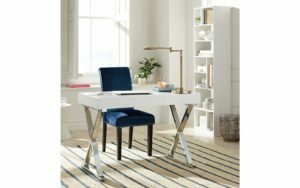 With so many options, choosing a new home office desk chair can seem overwhelming. Some office or desk chairs are designed for infrequent, brief utility while others are made for daily, heavy usage. And then there are factors like style, finish color and price to pay attention to. Here’s a quick list of questions to ask and tips for buying the office chair that’s right for you. 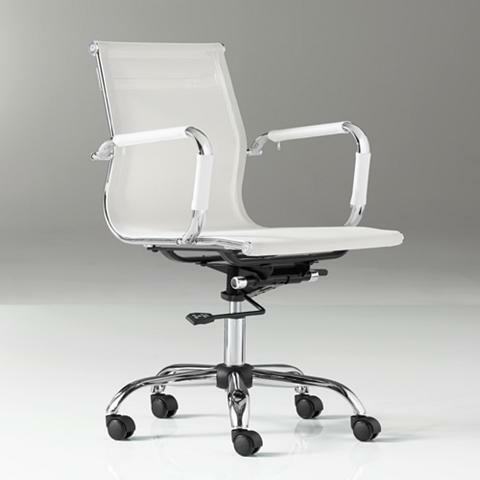 Different desk chair types have been designed for different uses and office environments. For example, an executive chair allows for comfortable conversation whether you’re talking directly to a person or using the phone. If you have back issues you may want to look at task chair. Task chairs have been designed to offer greater back and body support when sitting. They typically come with a wide range of adjustments to help you maintain good posture and sit erect. Ergonomic chairs also offer great back support and are ideal for heavy computer users who are at a desk for long periods of time. Ideally, an ergonomic chair should comfortably support your back to maintain an erect posture. If you work in front of a computer then getting the right computer chair can make a big difference in your long-term health. Your position and your ability to adjust it is a large factor in your day-to-day-satisfaction. 2. What Parts are the Most Important? Most office chairs have the following main part components: the back rest, the seat, and the arm rests. The key to a great back rest is lumbar support. Matching the natural curve of your spine supports your upper body and relieves the muscles in your lower back. Finding a chair that allows you to recline as necessary can be a big plus. The seat is also important. You can promote proper blood flow to your legs with a seat edge that’s rounded and slopes down. For those of us taller, heavier or wider than average, you may can find better support by keeping an eye out for wider seats and higher backs. Armrests allow you to position your hands comfortably when typing. Adjustability allows for differences in height and size. Depending on how your desk is set up, you may want to make sure that the armrests allow you to pull up as close as you’d like to your desk. 3. How Does It Adjust? You may want to fine-tune your position for a various tasks to prevent injury. If so, an adjustable office chair is just what you need. Adjusting the various components should be easy so make sure you can maneuver easily with knobs and levers while seated. Today’s chairs can come with a variety of mechanisms including height control, tilt tension adjustment, movable lumbar support, and tilt angle control. A swivel chair with casters allows you to move quickly from one area of your desk to another. 4. What’s the Desk Chair Made Of? Upholstered chairs offer a cushioned seat, as well as, multiple style and color options. Stain-resistant synthetic fabrics can provide durability or use a spray-on fabric protector for natural-fiber upholstery. A leather chair offers comfort and durability. Faux leather office chairs and chairs manufactured in vinyl material offer for easy cleaning. A mesh chair has the best ventilation and can conform to your body’s shape. 5. Where Will You Use the Chair? This is the point where you consider style, color, and dimensions. Does your workspace have carpet or hardwood floors? Consider casters or a swivel chair if you’ll need to move around to access a printer or face a co-worker. If you are setting up a desk in a bedroom or small office then you may want to choose a design with a lower back or without armrests to avoid overwhelming the space. You can stay consistent with the rest of the room by choosing the right material as well. There are a wide variety of both traditional office chairs and contemporary office chairs to create a cohesive look.